There’s nothing like having a new food experience. When you find a new ingredient you really love, you want to eat it all day, everyday, for an entire week; you can’t get enough. 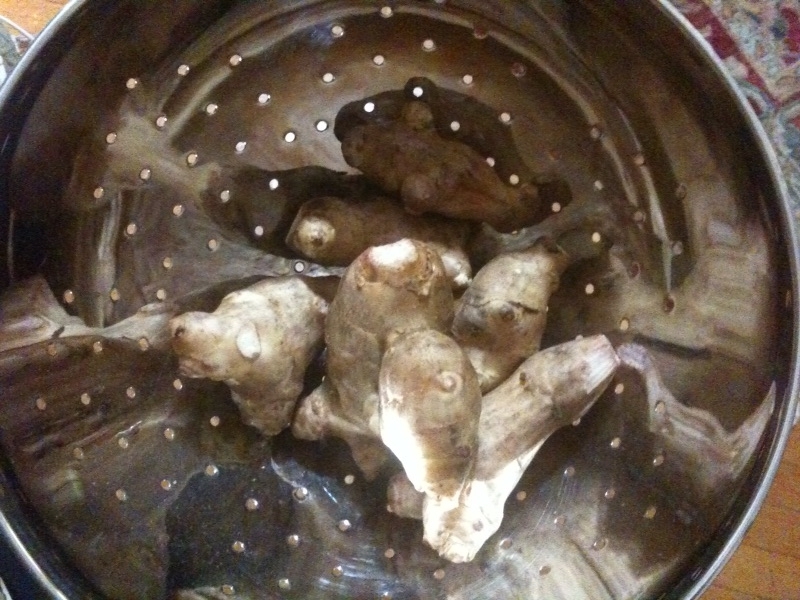 You ask, “sunchokes, where have you been all my life?! ?” Or at least, that’s what I did. I was introduced to sunchokes for the first time over Thanksgiving break, when I got a chance to eat at Heartland, the new James Beard nominated restaurant in Minneapolis-St. Paul. Heartland’s philosophy is that local, sustainable ingredients make the most delicious meals, and I believed them more with every bite. Roasted sunchokes were the highlight of my dish, walleye with kale and chanterelle mushrooms in a tomato broth. 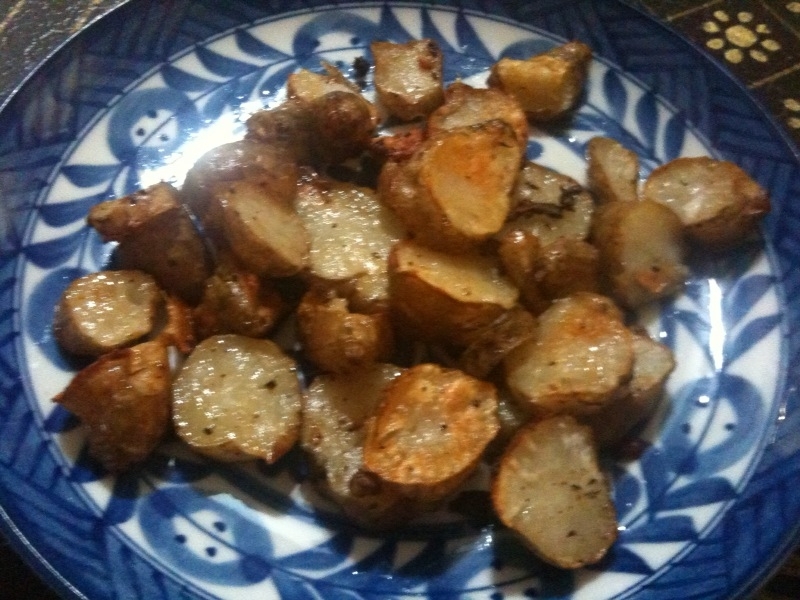 They had the rich, nutty sweetness of an artichoke heart crossed with the creamy texture of roasted fingerling potatoes. YUM! 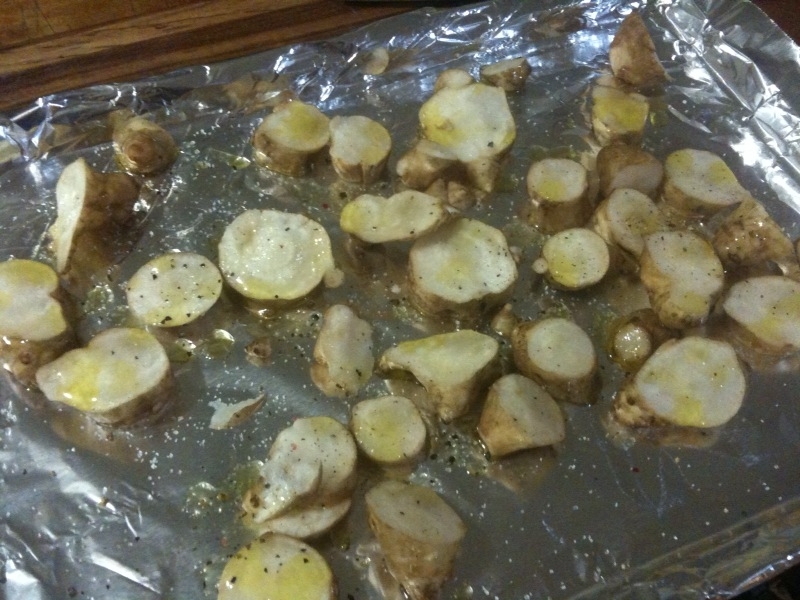 Because they have such a similar flavor to artichokes, I was surprised to find out that sunchokes, which are also known as Jerusalem artichokes, aren’t actually related to their namesake vegetable. 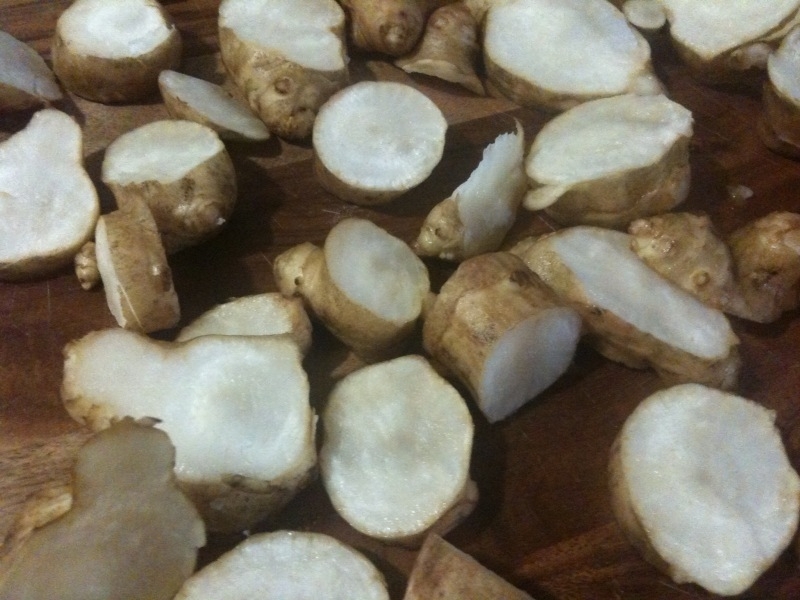 Sunchokes are actually a type of sunflower, and their root, which is a tuber that actually looks a lot like ginger root, is what you eat. I love the flavor you get from roasting them like a root vegetable–and I also love that, as you can see from the recipe below, it makes for a quick and easy meal–but you can also shave them very thinly and eat them raw on a salad. Best of all, sunchokes are packed with potassium (650 mg per cup) and iron, which makes them a yummy, nutritious alternative to potatoes. Scrub the tubers and remove any black “eyes”, just like you would clean a potato. You don’t need to peel the skin off of the chokes–it contains a lot of nutrients, and has a delicious flavor and texture after you roast them. 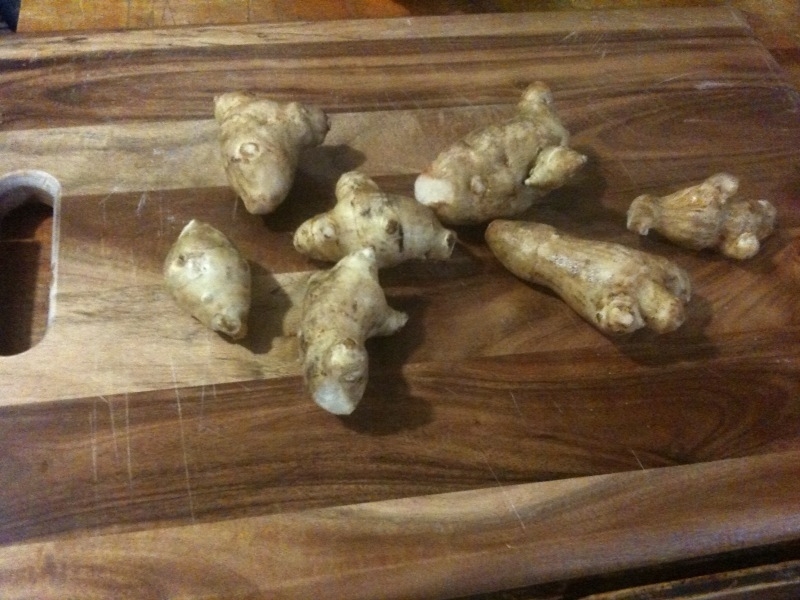 Don't sunchokes look just like ginger root? Slice them up into medallion-sized pieces. 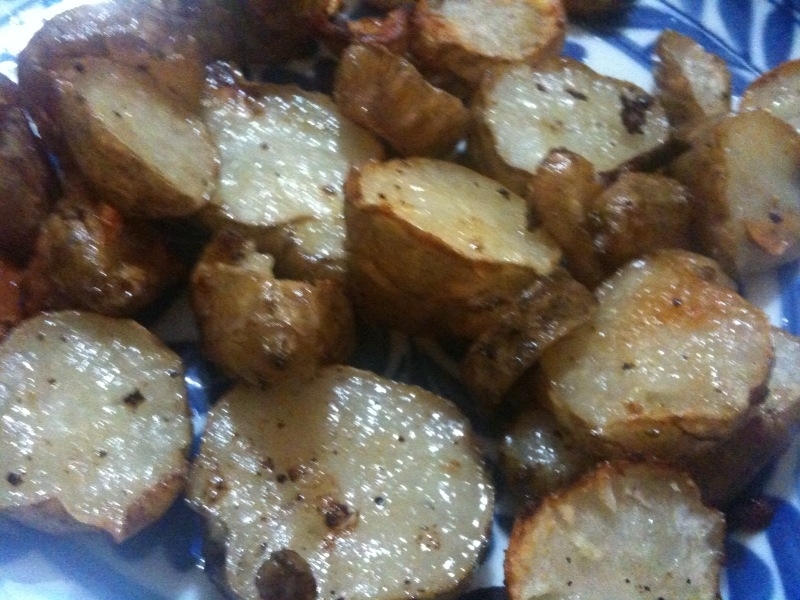 Place the pieces onto a roasting sheet covered with aluminum foil, drizzle with olive oil, and sprinkle with sea salt, pepper, and a little garlic powder. Roast in the oven at 400°F for 15-20 minutes, or until the pieces become deliciously golden brown. Being a chocolate connoisseur is a serious calling. Like a sommelier, I’ve been studying and educating myself for just over 25 years. And I made a promise long ago that I’d always use my powers for good. 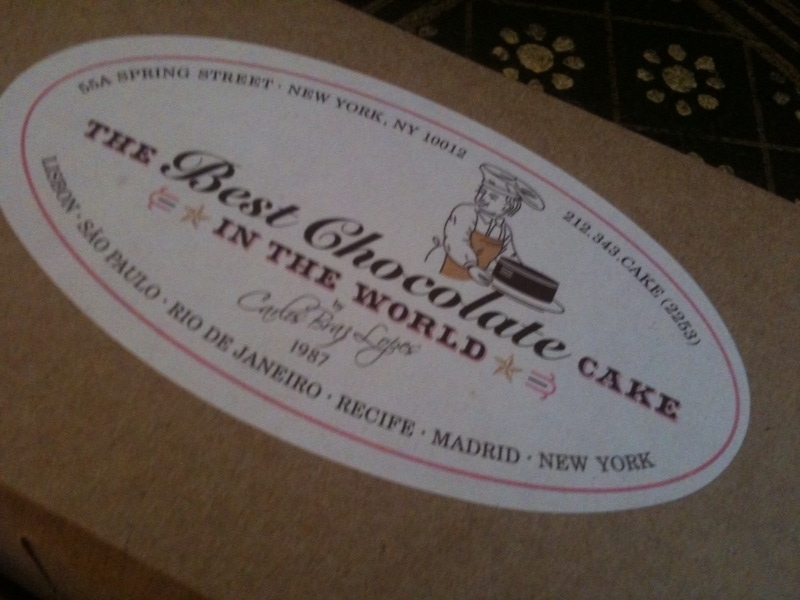 So, when I read about a bakery in Nolita boldly named The Best Chocolate Cake in the World, I knew what I had to do. I simply had to take a break from writing my final papers for the semester and try this cake. After all, it was my duty. 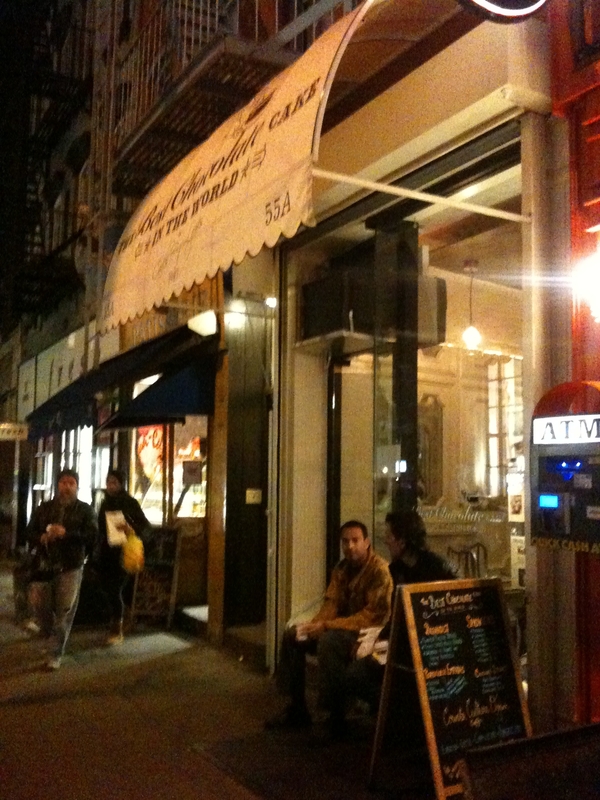 I headed down to Nolita with my Trusty Sidekick in tow. 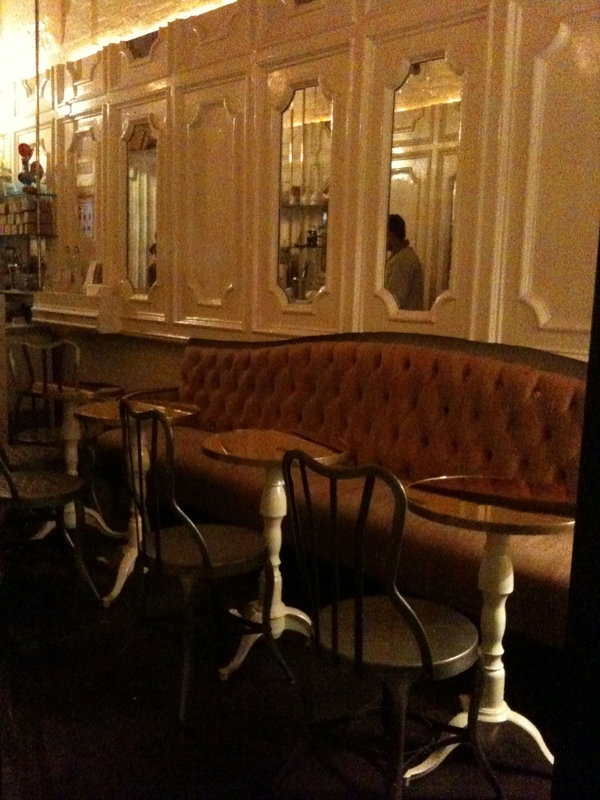 I really liked the interior of the cafe–it’s warm and cozy with soft, low lighting, plush sofas, and lots of mirrors–but because of homework waiting back home, we took our slice to go. Our first disappointment was the price. The Best Chocolate Cake in the World doesn’t come cheap–it’s $6 per sliver of a slice (?! 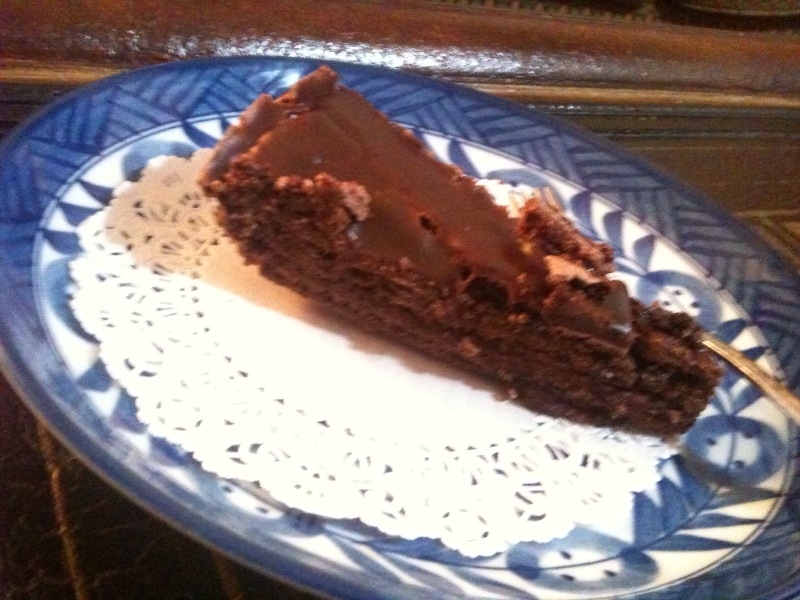 )–so we only tried the milk chocolate (for dark chocolate fans, they also offer a 70% dark chocolate slice). Just from looking at the slice, you can see the cake has lots of layers of cake and mousse, all topped by a rich, shiny ganache. But, take your first bite and you know right away that the word “cake” just isn’t right for this dessert. It gives you the expectation of a moist, devil’s food cake when the slice really has layers of flourless, crumbly, crunchy chocolate meringue. With the mousse and ganache, the taste is rich and chocolately, and it has a nice texture–but, well, it’s the texture of meringue–not cake! So, chocoholates everywhere, be forewarned: this cake is a fake. It’s a delicious chocolate experience, but because it’s really not cake, it just couldn’t be the best chocolate cake in the world. p.s. 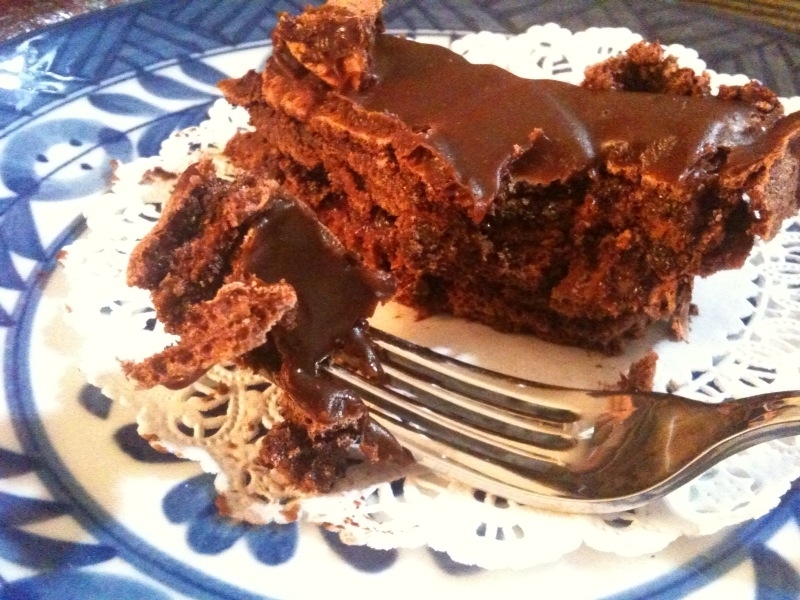 Have you had the Best Chocolate Cake in the World? Tell us where to find it!